No teams ran the front and rear interconnected suspensions at Hockenheim during Free Practice on Friday, but it seemed to make little difference. 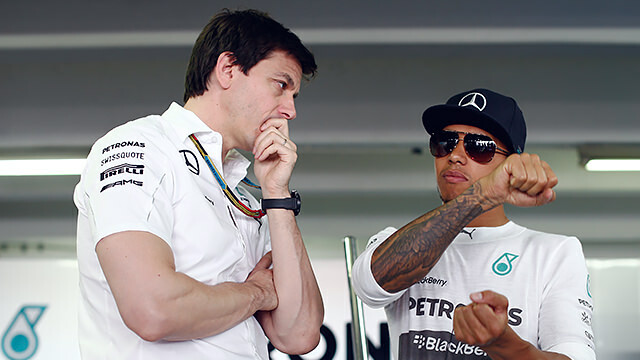 Mercedes still topped both sessions - Nico Rosberg the first and Lewis Hamilton the second. Susie Wolff had her second attempt at a practice session, and had her second experience of slowing to a halt during a lap. This time, she managed to get the Williams back to the pit lane and rejoined the action later to complete 22 laps, finish 15th and only two tenths off Felipe Massa’s time. The second session was all about Caterham, as first Marcus Ericsson stopped out on track just minutes into the afternoon running. Later, Kamui Kobayashi pulled off track with smoke billowing from the green car. The marshals moved in, but not quickly enough for Kamui, who grabbed for the extinguisher and finished the job himself. The fastest three at the end of the day were Lewis Hamilton and Nico Rosberg, with Daniel Ricciardo best of the rest.